Roofers were working atop Calapooia Middle School Wednesday. Roofing material was stored on the parking lot. 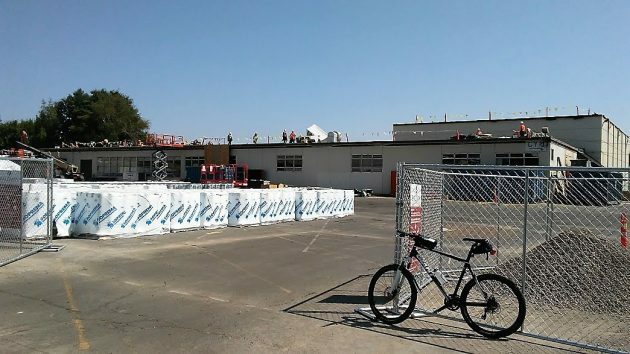 I asked the district about progress after I stopped outside of Calapooia Middle School on Aug. 1 and took some long-distance snapshots of people working on the roof. Me being there made the foreman nervous. He came off the roof and waved me over, wanting to know who I was and why I was taking pictures. I didn’t understand why he was concerned about someone pointing a phone at his crew from a public parking lot. I gave him my card, but when I dug out a pen and paper to get his name, he declined to give it. Weird, but I assume it doesn’t detract from Calapooia getting a good new roof. In its August update on projects made possible by the $152 million in bonds sold by Greater Albany Public Schools last year, the district says construction projects are “on track to be completed before teachers return to school” at Lafayette and Sunrise Elementary, Calapooia Middle, and Timber Ridge School. Oak Grove Elementary has been completely demolished so that construction of its replacement school can be built. The district hopes the new school will be ready to open in the fall of 2019. At South Albany High School, the start of its expansion has been postponed until the summer of 2019 because bids came in too high and new ones will be sought this fall. Completion is expected by the fall of 2020. At West Albany High, the first phase of eventually replacing the entire school with a bigger one will be put out to bid this coming winter. The district hopes to start construction next April and open the new facilities to students in the fall of 2020. As for Meadow Ridge, a brand new school, the district reports that after a long delay, it now has a “wetlands permit” from the U.S. Army Corps of Engineers. The delay has cost the district $500,000 to $600,000, the school board was told in June. The building won’t be ready for the start of school in 2019. But the district hopes to move at least the pupils from Clover Ridge to Meadow Ridge during the 2019 Christmas break. Imagine the frustration State and Federal agencies experience when working with local school boards state/nationwide. Precisely! Every power-hungry wannabe that couldn’t qualify for higher authority went for local school board seats. Dealing daily with local yokels must be horrid. Tell us why a delay in starting construction for Meadow Ridge, a new school, costs the district so much money. You, or the district, didn’t explain. Is it because prices of construction material continue to rise? Just exactly what causes the monetary cost of the delay? Of course, a consultant, representing either the construction companies or the school district, is going to say the delay costs big bucks. The foreman’s reaction makes me want to go there and take pics also. So many people have so little grasp of public place vs. private place and what that means in terms of observation, photography, etc. What if the foreman is aligned with the 30% stronghold in Cult 45? The HH credential wouldn’t matter. Obviously didn’t matter. What if that foreman is taking the con man’s words verbatim. All the fake hatred towards the media. For what? Nutty rally whoop and hollar applause lines? Discredit of the truth. Worse? Cover. Thinking…. Wondering…. What your thoughts are Hasso as a media man.